There's nothing less appealing than an Oscar bait biopic that sticks to the standard formula. Thankfully, those behind this film about author and literary forger Lee Israel are aware of that, fashioning her story into a queer buddy comedy about loneliness, and securing a trio of Academy Award nominations for their efforts (for Best Actress, Supporting Actor and Screenplay). Director Marielle Heller (The Diary of a Teenage Girl) and writers Nicole Holofcener and Jeff Whitty cherry-pick and embellish the choicest titbits from Israel's 2008 memoir, which documented her crimes from the early 1990s. The title of the film is a quote from one of Israel's many forged letters – one purporting to be the work of Dorothy Parker, although Israel also emulated Noel Coward, Louise Brooks and Fanny Brice amongst others. Melissa McCarthy plays Israel as an isolated woman who takes tremendous pride in her work, nailing the excitement and pleasure she gets from her cunning scheme. It's one of the actress's best performances – she slides comfortably into the tweed jackets, patterned sweaters and stubborn temperament of an alcoholic writer faced with severe financial difficulties and an ailing, beloved cat. Richard E Grant seems equally at ease in his role as co-conspirator and party animal Jack Hock, taking his seat next to his bar buddy for another round of shots and misconduct. Heller uses the New York setting to conjure a cosy ambience when McCarthy and Grant are up to their necks in hijinks, but blows in an icy breeze when the FBI start tailing them as suspects. The screenplay is intelligent and multi-layered in its approach to the value of the written word and how it declines according to fashion; it displays an aptitude for the kind of humour that derives from the darkest places and knows too when it's time to be sincere. 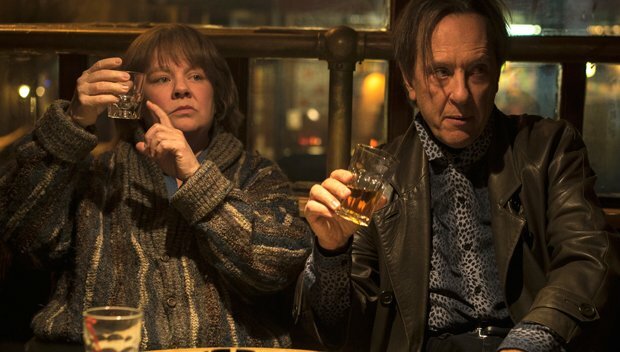 As it sweeps you exhilaratingly back to the 1990s, Can You Ever Forgive Me? is deviously funny and deeply moving.